Thank you for always being a great place to easily request novels, and for being so easy for me to deal with! Thank you all for being so friendly and helpful during our constant pursuit to bring reviews to potential readers and to connect authors to them as well. Thank YOU for being the heartbeat behind the world that is book blogging. Without you wanting recommendations for good books and authors, we would be nothing! Thank you for providing us with books we love, dislike, throw across a room, and sleep with under our pillows. Every read is important regardless of review outcome. I just really love my kindle for making it easier and cheaper for me to buy certain books since my library has almost run out of space! Such a great way to connect with readers, authors, publishing houses, and publicists! I met a lot of you at Book Expo America this past year, and am fortunate to be attending this year with some I met. You make the business of blogging so much fun and informative. 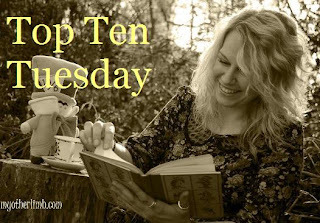 I just really love going through your lists of upcoming releases so I can know which books I definitely want to track down, and which ones I can add to my evergrowing Waiting on Wednesday posts! My co-blogger, who has been a great help this past year since she started helping me. She was responsible for keeping the blog up when I had elbow surgery and was unable to type for a few weeks. Thank you for giving us the gift of books constantly throughout each year. I honestly don’t know what I would do without being able to pick up a novel and escape for a while. What bookish things are you thankful for this year? 1. Followers: Without you all, I wouldn’t have an audience to review for! Plus, I love all of your comments and participation! 2. Contributors: Missy, my partner in crime, is amazing and I couldn’t do this without all of her help! 3. Publicists: You know who you are. You do your best to make sure that reviewers have some of the best tools at their disposal and provide us with your help and support! 4. Blog Tours: Thank you to all tour organizers, especially GCR Book Tours and Book Nerd Tours for all that you do! 5. Authors: Thank you for inspiring me to become a book blogger. 6. Netgalley: A great way to receive advanced reader copies and help authors promote their books! 7. Edelweiss: Very similar to Netgalley, and is a great way to network with publishing houses. 8. Twitter: An easy way to get the word out to followers and potential followers. I love you all. 9. Fellow Bloggers: You all ROCK, and I love your blogs. 10. Blogger: I can’t leave out my hosting site! Blogger is helpful and has been extremely easy to use.